The entire femoral head as well as a good part of the neck lie inside the joint capsule that has a fold at the lateral part of the neck (capsula reflecta). At this site the neck is covered by a relatively thin synovium. Its posterocaudal and cranial parts, containing irrigating vessels, is thicker. The posterocaudal part is known as retinaculum Weitbrechti (Hulth, 1956). The synovium that is cranially tightly and caudally loosely attached to the neck has no cambium layer; for this reason no periosteal callus will develop here after a fracture. 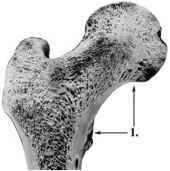 Such a formation will only occur in the extraarticular caudal part after a vertical (Pauwels-III) fracture (Fig. 6). The vessels that supply the head and part of the neck enter the retinaculum from distal. At the anterior aspect of the neck, in the region between inter-trochanteric line and capsular fold run the lateral circumflex femoral artery and vein. At the posterior aspect medial to the intertrochanteric crest the most important vessels are found: the medial femoral circumflex artery and vein. Under normal circumstances the artery and vein in the round ligament play a minimal role, however, following a hip fracture their importance can increase (Figs. 7 and 8). Fig. 6. Proximal end of the femur. a. Frontal and sagittal cuts. The retinaculum inserts cranially as a thin adherent structure (1.). Posterocaudally the retinaculum is thicker and inserts loosely and more extensively on the neck (2.). The intertrochanteric crest forms posteriorly the limit of the base of the neck (3.). The gluteal tuberosity also known as trochanter tertius (Vajda, 1989) (4.) serves during nailing as a reference point for the introduction of the guide wire. The sagittal transverse section of the neck is oval in the middle and lateral thirds. The posterior and caudal cortex is thicker (5.). 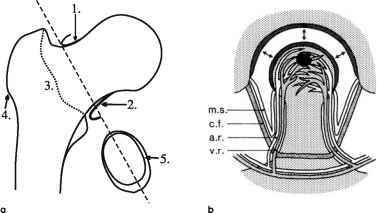 b. Schematic representation of the topography of the retinacular vessels, the synovium and the joint capsule (according to Arnoldi, 1994). Fig. 7. Topography of joint capsule fold and blood supply. Schematic view from a. = anterior and b. = posterior. Fig. 8. Area supplied by the three principle arteries under physiologic conditions (schematic) (Parker and Pryor, 1993). Fig. 10. Calcar femorale. 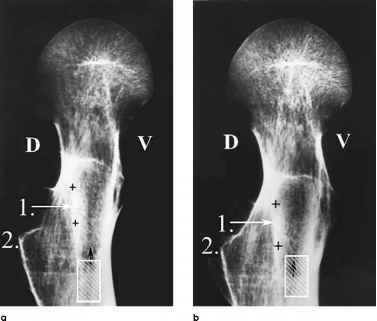 a. Schema of a typical lateral radiograph of the neck; b-e. Sagittal CT serial cuts of the proximal femur specimen. Fig. 11. Localization and course of the calcar femorale. Cadaver specimen. a. Almost in mid-femoral neck; b. Close to Adam's arch, curved cut. c, d. Corresponding to CT cuts. The schemata show the plane of cutting (M). The photographs were taken from caudal. Posterior side (D), anterior side (V). The calcar femorale (1.) runs intraosseously from the middle of the femoral neck to the lesser trochanter (2.) and ends in the posteromedial cortex of the cranial neck where it unites with Adam's arch. (Not visible here). (a, c). Close to the Adam's arch (b, d) the calcar femorale is thicker. The hatched area (3.) shows the ideal slightly anteriorly situated position of the caudal screw between calcar femorale and anterior neck cortex. At this site one obtains a better support than in the middle where drilling damages the calcar femorale. e. The importance of the calcar is well seen on the postoperative lateral radiograph. During faulty aiming the spiral drill bit can break in the hard calcar insertion of the capital femoral ligament that originates in the acetabular fossa. The very strong medial cortex of the femoral diaphysis continues on the medial side of the neck as Adam's arch. 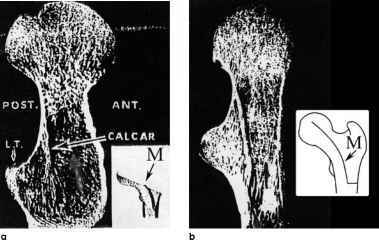 From the lesser trochanter to the head the calcar gets thinner and ends in a system of compression trabeculae (Fig. 9). The cross section of the neck is mostly not circular but more oval caudally, as also seen in CT serial sections (see Fig. 10b-e). Most of the fractures pass through the oval zone; its vertical diameter (32 to 39 mm) is almost one cm longer than the sagittal (25 to 31 mm). Fig. 12. Fine-grained typical lateral radiograph of a cadaver femoral neck specimen. ontogenesis leads to its migration to the center of the neck (Harty, 1957) (Figs. 10-12). In many publications, particularly in the Anglo-American literature, no distinction is made between calcar femorale and Adam's arch; both are termed calcar. 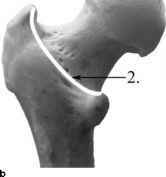 In the German literature the term "Schenkelsporn" (calcar spur) denotes that in poorly impacted fractures the calcar remains attached to the neck fragment and is lodged in the femoral head. Already 40 to 50 years ago, many well-known authors discussed the importance of the calcar femorale (Speed, 1942; Harty, 1957; Harty, 1965; Harty, 1966) (Figs. 13 and 14). The bundles of cancellous bone (Adam's arch and calcar femorale) starting in the diaphysis eventually unite in the femoral head in a gutter-like structure and reinforce similar to a gothic arch the medial and posterior wall of the neck. This gutter plays an important role in the stability of internal fixation. These trabeculae support the implant that rests similar to a lever with two arms on this support (Fig. 15). Fig. 14. Calcar femorale as seen on the original figures by Harty (1957). Fig. 15. The principle of the three-point buttressing. Fig. 16. The Shenton-Menard line. Fig. 17. Anteversion of the femoral neck as seen on lateral radiographs (Le Damany, 1903). Fig. 19. Contours of the femoral neck. 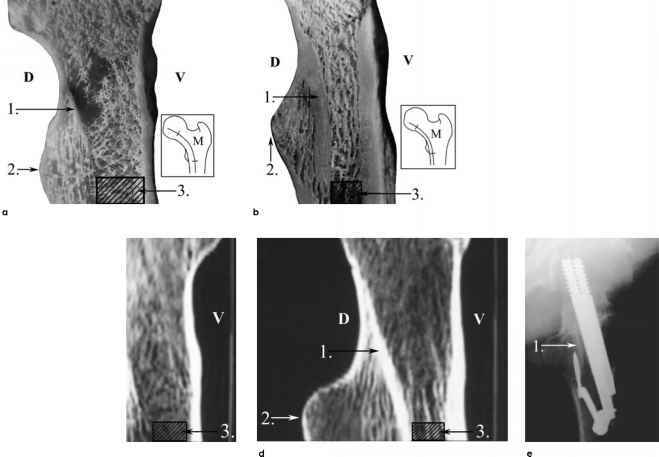 a. Schema of a typical lateral radiograph (Pannike, 1969); b. CT cut of a cadaver specimen. The anterior contour (1.) is convex, the posterior (2.) is concave. Fig. 20. Cadaver specimen of the proximal femur. a. Anterior view; b. Posterior view. Fig. 21. Proximal end of femur. a. Schema; b. Fine grain a.-p. radiograph of a cadaver specimen. Fig. 22. Proximal femur. Schema. Correlation between extent of Ward's triangle (1.) and age (Manninger and Fekete 1982). a. In younger person; b. 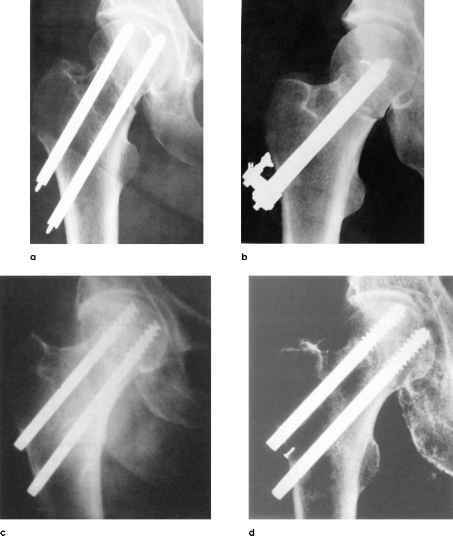 In 60- to 70-year-old patient; c. In 90-year-old patient diagnosis or after internal fixation a little kink in this line indicates the site of fracture or displacement (Fig. 16). The longitudinal axis of the neck is angulated anteriorly by 10-15° in relation to the longitudinal axis of the shaft (anteversion) (Fig. 17). The anteversion develops during growth through a mechanism of rotation. The proximal end of the femur rotates anteriorly by 10-15° in relation to the transverse axis of the femoral condyles. It would therefore be preferable to talk about an antetorsion. However, the majority of orthopedic textbooks use the term anteversion in accordance with the clinical usage (Fig. 18). The anterior contour of the neck is slightly convex and the posterior concave. The posterior border of the head projects over the neck. The latter is therefore slightly rotated backwards like an arch (Fig. 19). Anteriorly, the intertrochanteric line and posteriorly, the much stronger intertrochanteric crest connect the greater and lesser trochanter. Both lie approximately at the base of the neck. The intertrochanteric line runs slightly more cranial from the cranial border of the lesser trochanter to the apex of the greater trochanter. The intertro-chanteric crest lies slightly more caudal, running from the middle of the lesser trochanter to the apex of the greater trochanter. 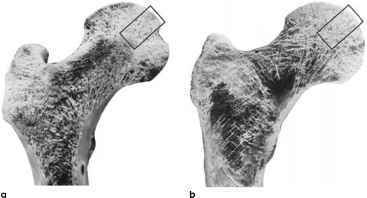 The knowledge of position and projection of the lesser trochanter is important as it indicates on the a.-p. film the rotational position of the proximal femur. In the presence of external rotation it appears much bigger whereas in internal rotation of 15-20° only its apex can be seen. At the anterior surface of the neck under the ilio-femoral ligament an anterocranial reinforcement (crest, eminence) is well visible (Fig. 20). 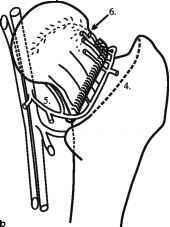 The gluteal tuberosity (trochanter tertius, tu-berculum innominatum) lies lateral to the greater trochanter (see Fig. 6). From the standpoint of traumatologists the term innominatum = without name is unjust. It regularly serves as a point of orientation during the formerly done open reduction (double nailing according to Smith-Petersen). 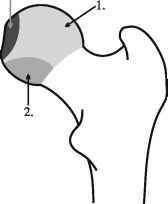 The entry point of the guide wire should be two-finger breadth distal to this tuberosity. It is also the site of origin of the vastus lateralis, a muscle we incise and partially detach during the retromuscular approach. 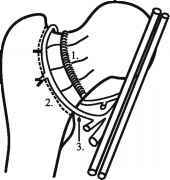 It constitutes the third point of support when we are forced to proceed with an open internal fixation. 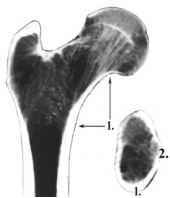 The proximal end of the femur contains cancel-lous bone. The most important trabeculae, the compression trabeculae, run from Adam's arch to the weight bearing surface of the head whereas the tension trabeculae form a vault at the cranial part of the neck (Fig. 21). If the cranial screw during fixation with cannu-lated screws is placed posteriorly, it avoids the middle bundle of the compression trabeculae under the most important weight bearing surface of the head (and thus does not weaken it). On the lateral film the screw tip can be seen posterior to these trabec-ulae. In elderly patients (over 80 years of age) the more anteriorly placed screw does not damage this important zone (see Fig. 136b). Sparing the compression trabeculae during surgery is not only important from the point of view of stability but also for the avoidance of circulatory disturbances. Fig. 23. Proximal femur. Cadaver specimen. Fig. 24. Four times magnification of areas marked in Fig. 23. Necrosis occurs most often in the middle of the weight bearing zone where these trabeculae are found. With advancing age Ward's triangle between the two bundles of trabeculae in the middle of the femoral neck becomes visible. Also accompanied by increasing osteoporosis the number of trabeculae decreases and finally they disappear being replaced by fat. It follows that the cranial implant is not supported inside the neck (Figs. 22 and 23). To the contrary, in the head no cavities form similar to Ward's triangle. 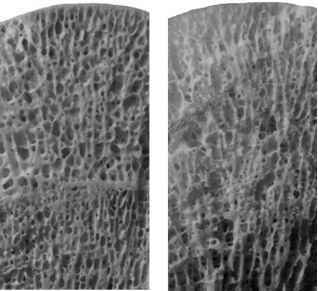 Even in older persons the subchondral bone mass at the weight bearing surface remains dense (Fig. 24). Therefore we always can count on a good purchase of screws in the head. Depending on the degree of osteoporosis the stability can be increased by choosing screws of a larger diameter or by the addition of screws. 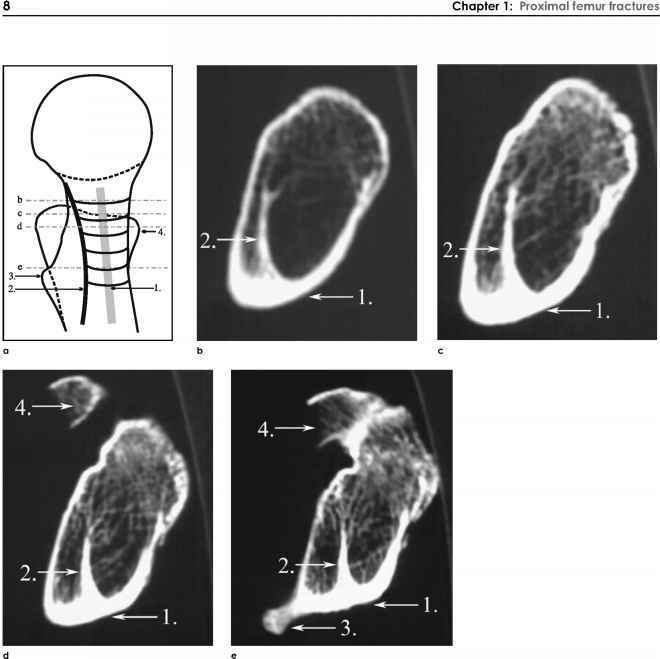 On the other hand, one should always obtain a good subchondral fixation (Rehnberg and Olerud, 1989; Olerud and Rehnberg, 1993). Already 18 years ago we recommended in the fifth volume of the Hungarian specialty journal that during nailing the implants should be advanced up to 3-4 mm of the head contour. This led to a good purchase. When reaching this position during hammering a greater resistance can be felt and a higher sound is heard. One hears a so-called falsetto (Manninger and Fekete, 1982).